NASA's Mars Telecommunications Orbiter (MTO) will be the first spacecraft to travel to another planet for the primary purpose of relaying communications to and from Earth. In fact, it will serve as a Mars communications hub for a growing interplanetary Internet. Rovers, science stations, and orbiting spacecraft will all communicate with Earth by sending and receiving signals via the Mars Telecommunications Orbiter. The spacecraft will be in contact with Earth almost around the clock, because its orbit will place it 20 times farther from the planet's surface than other spacecraft, meaning it will nearly always have a direct line of sight to Earth. 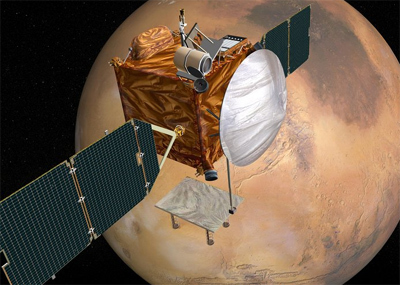 The Mars Telecommunications Orbiter will fly above the surface of Mars at a distance of 5,000 kilometers. Besides sending and receiving communications at radio and microwave frequencies, the Mars Telecommunications Orbiter will pioneer the use of lasers for planet-to-planet communications. These lasers will transmit and receive signals using near infrared light - just beyond the range of the electromagnetic spectrum seen by the human eye. The signals will travel tens of millions of miles through space. Though optical communications are more susceptible to inteference from clouds, they have the potential to transmit 10,000 times as much data as microwave communications. During its 10-year mission in orbit, the Mars Telecommunications Orbiter will send the equivalent of three full compact disks of data to Earth each day. These will include data from the Mars Science Laboratory, which will land on Mars about a month after the Mars Telecommunications Orbiter enters orbit around the planet, and deploy a robotic rover to conduct more detailed scientific observations of the martian surface than ever before. The Mars Telecommunications Orbiter will also carry a sphere the size of a soccer ball and track the device after deploying it in orbit around the Red Planet. This demonstration will support NASA's plan to launch a Mars Sample Return mission in 2013 to collect and bring Mars rocks back to Earth robotically. Successful retrieval of the samples will require an orbiting spacecraft to accurately track and intercept a sample container launched from the martian surface. Lockheed Martin Space Systems is expected to land a NASA contract to design and build the $500 million Mars Telecommunications Orbiter, which the space agency said will pioneer the use of lasers for planet-to-planet communication. NASA and the Jefferson County-based aerospace company are in negotiations expected to lead to the award of a design-and-construction contract in June 2005. The MTO design will be based largely on the Mars Reconnaissance Orbiter, another NASA spacecraft built at Lockheed Martin's Waterton Canyon facility in Jefferson County. NASA cancelled the plan to construct MTO in July 2005.
six 170 N monopropellant engines ?